No pension. Then, tell me why it is a good deal. Sorry.. I meant 33k in social security. I plan to have some Roth while my tax bracket is low and some pre-tax 401k later on (I already have some, more than I wished). When retirement approaches, I'll decide better whether to contribute more in Roth or in 401k pre-tax. Again, I expect my marginal tax rate to >= 22% on retirement (*after* all the 401k pre-tax I'll distribute), so contributing Roth at 22% or 24% now it's a no brainer. 1) A person can postpone social security up to 70 years old. 2) You are assuming that person is employed continuously all the way up to 70 years old. Is this a good bet? Show me the numbers. The math does not work out. There are 50K every year at 12% and below for a single person. Roth generates no taxable income. Show us the number. In order for this to be a good deal, the retirement tax bracket needs to be higher than 22%/24%. Or else, it is a wash. Then, it does not make sense to contribute to Roth 401K. If you have the choice of paying me $1,000 now or $1,000 30 years later, what would you choose? It should be a no-brainer that you want to pay me 30 years later. You guys should start with some assumptions on income, current tax, future tax, and then do the numbers on several scenarios, and then compare! Math is a universal language! Also consider that the Roth IRA does not require an annual RMD after attaining age 70.5, but Roth 401(k) does require RMDs to be taken out of these accounts. Always the same story by the same posters with regards to Trad/Roth. This issue will result in a right/wrong solution in HINDSIGHT only. People speaking in definitive terms of one being wrong or right without having ALL relevant facts INCLUDING current state/local/fed marginal tax rates and actual tax rates upon withdrawals (factoring RMDs, SS, pensions, taxable dividends) is strictly speculating. Always such a frustrating read as heels dig in with folks' opinions stated as facts instead of merely confirmation bias due to their own personal situation. Best advice I can give to people wondering which way to go is to learn to do your income taxes BY HAND. This will allow you to work through all the intricate details that effect personal marginal rates and allow you to take all of these opinions and apply them to your personal tax situation. In summary, it's basically as KlangFool says. For most people, if the choice is between Roth or deferred, Roth usually does not make sense. Hmmm. I will have a substantial pension, and almost all of our savings has been tax-deferred. As we're now in our prime earning years, with existing IRAs totalling low 6 figures, I can say that I wish we'd done better at putting more into Roth when we could do so easily. Our pension and Soc Sec income is going to push us into higher brackets in retirement than we are in now. And converting existing IRAS to Roth is difficult given the pro rata rule - we don't have funds on hand to simply pay the tax hit. Add in the RMDs, and our tax hit will be substantial - and ongoing. I'd would say that *if* you do not expect a pension, Roth accounts may not make sense. If you *do* have a pension, I'd recommend that you split your investments with some proportion in Roths if you can - having lower RMDs (and cash accessible without taxation) would be great for those of us who'd like to retire prior to Medicare age. +1 (or +2, as the case may be). Olemiss540 wrote: ↑ Best advice I can give to people wondering which way to go is to learn to do your income taxes BY HAND. This will allow you to work through all the intricate details that effect personal marginal rates and allow you to take all of these opinions and apply them to your personal tax situation. I agree with this, from personal experience. Tax figures in the abstract are helpful, but when we do our own taxes by hand, paper & pencil & calculator (and copy of IRS Pub. 17 instructions ) then we see how our taxes really work in front of our eyes in our own specific situation. Also, I speak from personal experience that foretelling personal future tax brackets is iffy - so it's probably best to diversify and have a little of the different types of retirement accounts plus taxable. Gives flexibility in case the unexpected happens. No one could have convinced me years ago that we would be well into a higher tax bracket when we are retired than when working - but it happened. And I see it in front of my eyes when I do our taxes: it's the income lines - retirement W-2 income, pension, RMDs & Soc Sec. Neither of these is the correct comparison, because your tax-deferred account grows, which also causes the tax to grow. You have the choice between contributing $3545 to a Roth 401(k) and paying $1000 in tax, or $4545 to a traditional 401(k) and avoiding the tax. If you retire in a 22% bracket, you will lose 22% of the traditional 401(k), and will wind up with exactly the same amount. For example, if your account doubles, the traditional 401(k) will be $9090, and 22% tax on that $9090 is $2000, which matches the $7090 in the Roth 401(k). The traditional 401(k) is better if you retire at a lower marginal tax rate, which is a more common situation, and that is why KlangFool and many other posters usually prefer it. However, given the assumptions above, it isn't a clear decision. I did an exercise like this. I found for my scenario it takes ~7-8% tax increase (with the same bracket structure) to make more ROTH better at least for early retirement years. Before I did this I was at 50% Roth 50% trad. That was enough to push me down to 33% Roth 67 % traditional. To me it still makes some sense to overweight Roth a bit compared to what assuming tax rates stay the same will do. Yes. Tax rates were 60% 70% 80% many times. They are comparatively very low today. I wouldn't be surprised at all if the top bracket was 50-60% or more by 2026. At which point, I will (not begrudgingly) make my way to a different country. Excepting that a Roth 401k can be rolled over into a Roth IRA upon separation from your employer which makes this a moot point. Given all the uncertainties of the tax code and my personal life, I'm assuming the difference between 22% and 24% is not meaningful. I willing to lock in on a 24% marginal tax bracket for retirement. If at 65 things change and I see I could have paid a little bit less, I'll take it. For instance, taxes can go up or I can retire in a country that taxes 401k distributions at a higher rate than US. I don't want to drag this forever, but would you acknowledge that in this theoretical example it would make sense? Then everybody can make out their own assumptions. Do the math and show us how this is possible. Given the uncertainties, you should have tax diversification: Trad 401K with Roth IRA. It is possible that the government may choose to tax Roth. Why would you put all your money into one tax basket? If we assume that the tax law stays the same, the tax bracket will adjust upward due to the annual inflation adjustment. After 40 years, the tax bracket will at least double. You can do both. Trad. 401K with Roth IRA. So, why only do Roth? P.S. : This is your money. If you do Trad. 401K and Roth IRA, you will pay less tax and be rich quicker. It is worthwhile for you to run the numbers and be sure. Nobody on either side is willing to move on this topic. I will continue to tell people to do Pre-tax 401k + Roth IRA for 95% of the cases. Being limited to save $18,500 or $19,000 it takes a long time to get to $500k or $1,000,000 in your 401k. Trimming 22% or 24% off to purposefully pay tax because "you know" you will get to those large numbers is sub-optimal. Nobody knows if they will get to those numbers. First get to $500k doing pre-tax. That means your Roth (if you can max) will be in that $125k+ range. You cannot un-pay a dollar of tax. People will happily twist to save .1% on the expense ratio but happily pay tax now. There are always opportunities to pay tax later (Roth Conversions, RMD, Regular withdrawals). I know some in their 80s will say, "boy I wish I paid more tax back in the day 40 years ago..." But, you made it to 80. You have a good chunk of money. As always a good discussion. Interesting to read the ideas on both sides. If my tax-deferred portfolio is big enough, I switch to Roth 401K. Could you elaborate on how you define big enough? Are you calibrating traditional contributions to match expected deductions available upon retirement? 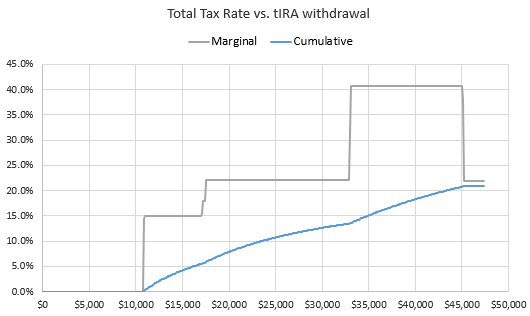 A common definition is "such that the expected marginal tax rate on a 4%/yr withdrawal matches the marginal tax saving rate for this year's traditional contribution." Then one gets into the definition of "expected," as in what rate of return, what tax law, etc. ??? I have been arguing to do both Trad 401k and Roth IRA. Only question is how much of each. If you are able to calculate, do the Roth you need at the beginning of your working life. Investing 23k (include employer match) from 40-65 years should/could give me 1.25M. Just assume 7% annual returns gives me around 1.579M. At 5%, it gives me 1.175M. So it's in that ball park. In anycase, my point is that with current taxes you should hit to have a marginal tax of 22% at retirement accounting the amount of pre-tax you will have. For the rest, use Roth. Calculate the 401k you may need and prefer to do it for the years where your tax bracket is higher. Max up the Trad. 401K and put the tax savings into Roth IRA is the best combination even in the early years. You forgot to inflation adjust the standard deduction and tax bracket. In 40 years, all those numbers will at least double. So, the standard deduction is 24K. You need around 2.5 million (100K X 25) to reach 22% tax bracket. So, in your example, the person is paying 12% marginal tax rate. "You need around 2.5 million (100K X 25) to reach 22% tax bracket." FWIW - in retirement a couple who delays SS and has near max benefits will get to the 22% bracket by a few methods. Not to mention pensions and when there is only one surviving spouse. 1) Please note that in this example, it is for an individual. 2) For a couple, the number is 5 million (200K X 25). So, it will not reach 22% bracket. The 22% tax bracket for a couple begins at $101K after figuring in the std deduction. Max SS for a couple at 70 can be $85K plus per year. The required RMD at 70 will be near $37K per one million of pre tax account. Or the RMD for $5M as 70 (per your example) will be $182K per year. There will likely be other earnings in after tax for such a situation as well which will add to taxes each year. 1) 40 years from now, all those numbers should be at least double after inflation adjustment. 2) What is the possibility for someone to be continuously fully-employed from now (25 years old) until 65 years old? "1) 40 years from now, all those numbers should be at least double after inflation adjustment." I suggest you utilize the IORP extended calculator and/or the RPM spreadsheet calculator to get a feel for varying these inputs. They both can take into account inflation adjusted taxes and they still cause a 22% tax in these cases. I have recommended you try them in the past if figuring these various possibilities. "2) What is the possibility for someone to be continuously fully-employed from now (25 years old) until 65 years old?" - This is not what the discussion and math was trying to solve for. - It has been more than 40 years since my first job, while I have not been 'fully-employed' that entire time I have been employed that entire time and I can assure you that the 'math' above has worked out for us. The funds we have will certianly cause a 22% tax given some genearlly typical returns unless we do larger Roth converions if we have the space to do them. I am looking for some advice about where we should direct our retirement funds. I have read many conflicting things about Roth vs. traditional 401k. Can someone explain what would be the best fit for us? Or perhaps direct me to some resources to learn more about it for myself? Some facts about us- married- both employed and contributing to retirement, 3 kids. Gross income ~$225,000. Debt-free except our mortgage which will be paid off in ~10 years or possibly sooner. Maxing out our HSA, saving for college for the kids. Both my spouse (age 28) & I (age 30) have the option to choose a traditional or Roth retirement account. Current retirement account balances are $110,000 in traditional 401k, $20,000 in Roth 401k between both of us. Currently on track for both of us to max out these accounts ($18,500 each this year). I am currently employed part-time & will likely increase my hours over the next 5 years (additional $50-60,000/year once full-time). I'm happy to provide other info as needed. I appreciate any help you can provide. Thanks! From the information you provided, it's likely that max out traditional 401k is preferable. Then max out Roth IRA/back door Roth IRA and saving in taxable account. And this is a "good enough" solution. Most people would stop here. - Contribute to Roth 401k when you're young in your career and expect to earn much more later. - You're a heavy saver and can max out every tax-advantage accounts and then some in taxable account. Roth 401k will give you more tax-advantage space than Traditional 401k. - Your traditional 401k is projected to be higher than 2.5M, which is not a difficult thing to do if you're a saver. - You want to take advantage of temporary lower tax break until 2025. - You value tax diversification and options to do strategic withdrawals to minimize taxes in your retirement. Don't listen to the soundbite such as "Roth 401k is a bad choice." It might be a bad choice for average American who income is less than 100k and having a hard time maxing out all tax advantage accounts. They will need to utilize traditional 401k so that they can save more money now and take advantage of compounding interest, and worry about taxes later. At the end of the day, how much you save is more important than which investment vehicle you're using. which doesn't get you to the 22% bracket. Years to attain will depend on your assumed rate of return, employer match, etc. I'm assuming 401k is your only taxable income besides Social Security. Also, these bend points (25k and 34k) are not inflation adjusted, so they will effectively be getting lower every year. If you are talking real numbers, you would discount these for inflation. So $34k might become 34k (1-.03)^15 = 21.53k in 15 years at 3% inflation. Thanks for the info. I was assuming the social security was 100% taxable. Still, it doesn't make a huge difference. There's a lot of confusing "ifs" in the Traditional vs. Roth discussions that I think are over most people's heads. I'm going to have a small pension from working 10 years at a job, and my effective tax rates have been 11.8% (2017) and 10% (2016-2014). I make under $100k and max a Roth IRA every year. I still have 30 years to work, and I am going to swap to the private sector soon and start contributing to a traditional 401k. I'll keep the Roth going as well. Other than using effective tax rates (instead of marginal) to guide your decision, perhaps nothing. The combination of traditional 401k (because for most people, traditional will be better than Roth) and Roth IRA (because for most people, the income is either too high to allow a deductible tIRA or low enough that Roth is not unreasonable) will work best for most people and is often a "default" recommendation. Doing your own homework on your current situation, and your best guess at your retirement situation, can give you information that will either support or contradict the default. And then you can repeat your analysis each year, and make course corrections when and if needed. Thanks! You’re right, I had that incorrect- I forgot that the 85% doesn’t begin as soon as the threshold is crossed (among other possible errors, it seems). I wasn’t aware of the toolbox, great resource. Edited for grammar.